Who wouldn’t like to have a spacious and comfortable home? That would mean a huge tub or a walk-in shower, great dining room table, and a kitchen big enough for all your dreams. It is, however, virtually impossible to find an apartment with a spacious kitchen. Does that mean that you should give up on your dreams? Absolutely not! We offer you several easy, useful tips which will help you create more space in your small kitchen ‘out of thin air’. You never have enough space in your cabinets, no matter how many of them you’ve got. One of the things you can do to fully utilize the storage capacity of your cabinets is use stackable shelves for your plates. Also, undershelf baskets are great because you can put bigger items such as jars or bottles in them. The space above your cabinets should not be wasted either, and you can place baskets here as well to hide other stuff. If baskets are not an option, you can mount a small additional shelf above your cabinets to place empty jars, and the things you don’t use often. Also, mount a file holder on the inside of the door and use it to stash trash bags, foil, and saran wraps. If your kitchen is small, you can work ‘small miracles’ in the cabinets, but the space will be limited nonetheless. This is why you can think outside the box and use your vertical space. 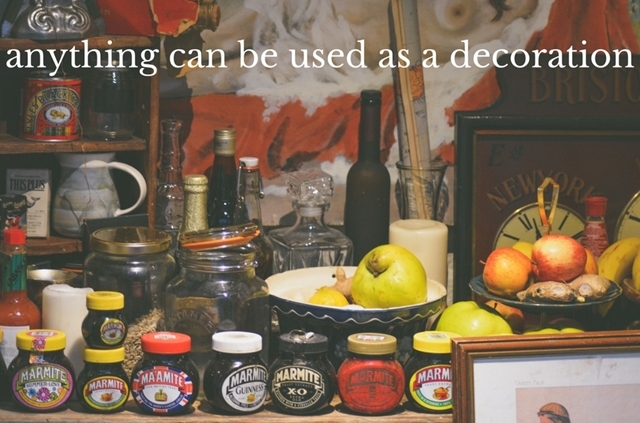 Larger kitchen utensils can easily be hanged on pierced corbels, if you want to avoid making a mess in your drawers. You can even add small ladders to your kitchen so you can reach even higher. Opt for a simple sliding ladder which will allow you to reach ceiling-height cabinets where you usually keep blenders, bread-maker and other things you don’t use every day. For finishing touches, choose some decorative wall clocks, some nice pictures or inspirational quotes. Another great space saver is bar and counter stools. Instead of using your kitchen solely for cooking, and choosing to eat on the couch or in the living room, you can eat on your kitchen counters sitting on bar stools. You can also choose to bring in brightly coloured stools which will add texture to the space. If you don’t have enough space for seating, you can try to create some by making a small, makeshift counter which will separate your living room from your kitchen area, which you can use as a dining table. 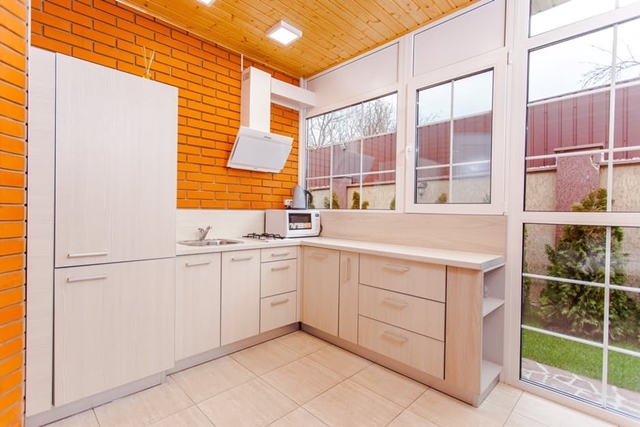 No matter how tiny your kitchen actually is, you will always have some small, unused spaces. A good example of such a space is the gap between the fridge and wall. Use this space to create a pull-out faux pantry where you can keep dry goods, cans, and jars. You can also make two cabinets which can slide out above the countertop, and you will not have a problem to find anything you need. Also, try placing trash cans and bins for recyclables below the sink, so you can pull them out when you need them. Cabinets are filled, pantry is full, counter space is too precious to be wasted, and drawers are well organized. Is there any other space to use? Your walls can be used and turned into a great storage space too. 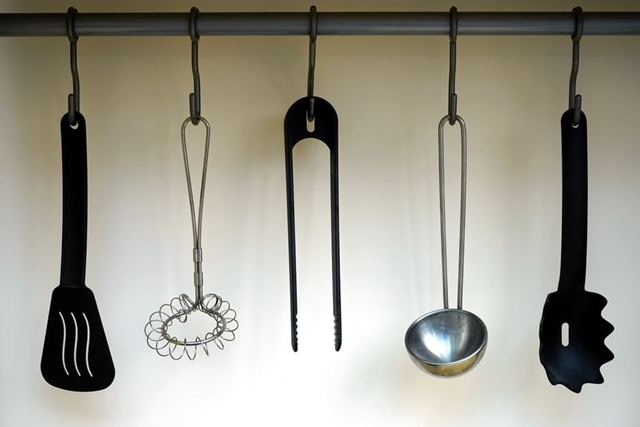 You won’t create an unnecessary mess on your work area if you just use hooks and shelves to hang pots, pans, and cups. Making a wall rack for your platters is incredibly easy and it will serve more than one purpose: you will get extra storage space, and get some new, great wall art. Your tiny cooking area doesn’t have to be a nightmare anymore. You won’t feel like your kitchen is bursting at the seams anymore if you improvise a bit, and come up with some innovative solutions. Small spaces are a bit more difficult to organize, but you can create a beautiful kitchen if you maximize your storage space. This entry was posted in ~Decorating, ~Solutions & Fixes, ~Storage & Organization and tagged Kitchen design. Bookmark the permalink.